End the summer with a new used car from a buy here pay here Chandler AZ lot. But before you do, find out the terms you need to know! When it comes time to sell a vehicle, there are several options available. You can browse online databases, shop CraigsList, and even get word-of-mouth recommendations from friends, family, or coworkers. No matter what kind of car you’re looking to sell, there’s always a wide range of options that will draw in more potential buyers. Other choices beyond selling by yourself include selling to a dealer or trading to a dealer. Although you may lose a bit of money choosing this option, it definitely will save a lot of time and stress. However, by trading in your car to a Buy Here Pay Here Chandler AZ dealership like Auto Action, you can drive off in a new car that very same day. The value of the vehicle you are selling can be applied directly to the purchase of your new vehicle, so you only will have to end up paying a very small amount for your new car, all in the same transaction. How simple is that? 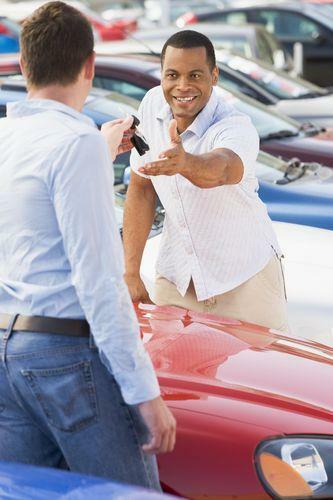 So where is the best place to start when exchanging your car for another? Learning how much money you can get for it! This value is known as your trade-in value. There are several ways to determine what this value is, including online resources like Edmunds or Kelley Blue Book. Doing research on the values of other vehicles that match your car’s make and model will also help when determining how much you should expect for your vehicle. Another option is to stop by your local Auto Action, where you can speak with an experienced trade-in dealer. At Auto Action, we can give you a great trade-in value which you can either accept or compare elsewhere. Once you determine and decide how much your vehicle is worth, you may need to evaluate how much you still owe on it. To find out how much you are upside down or underwater, you should subtract the value of the car from the amount you owe. If you owe more than your car’s value, you are considered upside down or underwater which is something you want to avoid. Using your online resources or local Auto Action expert will help you get a more accurate estimate of this value. It depends on your state, but most car buyers have to pay sales tax on the difference between the car you bought and the one you plan on trading. It’s recommended that you keep the negotiable of the trade-in value separate from the purchase of your new car. Trading in your car is certainly an easy and quick way to multitask a stressful situation. Knowing how the process works will only help you maintain the best value on your vehicle and find one that works for you without breaking the bank. If you’re still looking to learn more about these terms or Buy Here Pay Here Chandler AZ programs, contact an Auto Action expert or visit us at one of our convenient locations in Phoenix, Mesa, Avondale, Glendale, or Chandler. If you are ready to make a move and trade in your car fill out the form, browse our used car inventory on our website and apply for quick approval. It’s that simple!